I’m in the beginning stages of writing this novella, and already, I love it. It’s got excitement, intrigue, and a happily-ever-after ending I can’t wait to write. Hope you’ll look for the First Loves Forever Romance Collection. It releases April 1, 2018. 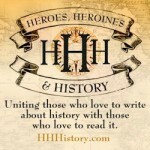 Of course, be watching the Heroes, Heroines, and History blog for giveaways of this and other collections I’m involved in as we draw near to each release date! I blog there on the 25th of each month, and I have some just-released or just-about-to-release collections I’ll be giving away! Thank you all for reading! Have a great weekend. This entry was posted in Uncategorized on June 3, 2017 by jenniferuhlarik. My co-authors and I on The Courageous Brides Collection are giving away a loaded Kindle Fire, which will include not only the Courageous Brides Collection, but many other titles by the authors from the collection. Please follow the Rafflecopter prompts below to enter! And good luck! This entry was posted in Uncategorized on June 28, 2016 by jenniferuhlarik. Thank you so much for stopping by. I’m glad you came. You know the old saying–“Hindsight is 20/20,” right? That phrase has never been more true than with my writing. Every child is born with a yearning to imagine and create, though it takes different forms for each child. Some pour their creativity out in paintings or drawings. Others choose crafts. Still others express their creativity with music. My creative avenue was writing, and I believe it has been in my blood since the day I was born. I have photos of myself as a young toddler with pencil and paper in hand, scribbling before I was old enough to know how to write. I fell in love early in life with books, when my mom would take me and my older brothers to the library, then let us snuggle in next to her to read what treasures we’d found. It was a very special day each week when the Bookmobile drove into my neighborhood and I got to peruse the shelves there. By the time I was five, I began sneaking out of bed at night to cut notebook paper into quarters, staple the pages into booklets, draw pictures of earthworms on each page, and write stories about the wiggly little creatures. And when I wasn’t doing these things, I was dreaming up elaborate stories to act out with my best friend each day that we’d play together. But even then, I didn’t recognize the gift that was inside me. It wasn’t until I was twelve that the writing bug really hit me. That was the age that “playing pretend” was getting to be kid’s stuff, and my friends were moving on to chatting about more mature topics, like the cute boys they had crushes on. Sure, that was all fun, but I missed the worlds I’d created in my imagination, and I missed acting out the lives of my made-up people. So when a good friend mentioned that she was writing a novel, it sparked the idea that I could keep on doing those things and not be branded a baby or a fool by my peers. I just had to write those elaborate imaginings down! (Thank you, Holly Zimmerman, for the inspiration. We lost track of each other long ago, but I wish I could tell you that you are one of the main reasons I am a writer today). In high school, I served on my alma mater’s literary magazine staff, where the idea of seeing my writing published first started to germinate. After high school, I went on to major in writing at the University of Tampa where I began my first novel-length project. That story was a practice field that would teach me much of what I needed to know about writing novels. It took six years to finish the first full draft, and another four years to rewrite, edit, and polish it into something I could show to publishers. (Yes, it was published many moons ago–along with a second stand-alone novel, but both have long been out of print). My early adult life was spent in working various day jobs while staying up all hours of the night to fit in some writing time. I never gave up the dream of writing and being published, but in those early days, it was more difficult since it had to be fit around job, home, and family. It has only been in the last seven years that I’ve been able to stay at home and write on a full-time basis. God has blessed me with three publishing contracts so far (see my books here), and I have lots of stories in mind to write, so here’s hoping there’ll be more to come in the near future. Thank you again for stopping by. I hope you enjoyed reading the nutshell version of my writing and publishing journey, and I hope you’ll look for my books! This entry was posted in Uncategorized and tagged Author's Journey, Jennifer Uhlarik on April 30, 2016 by jenniferuhlarik.